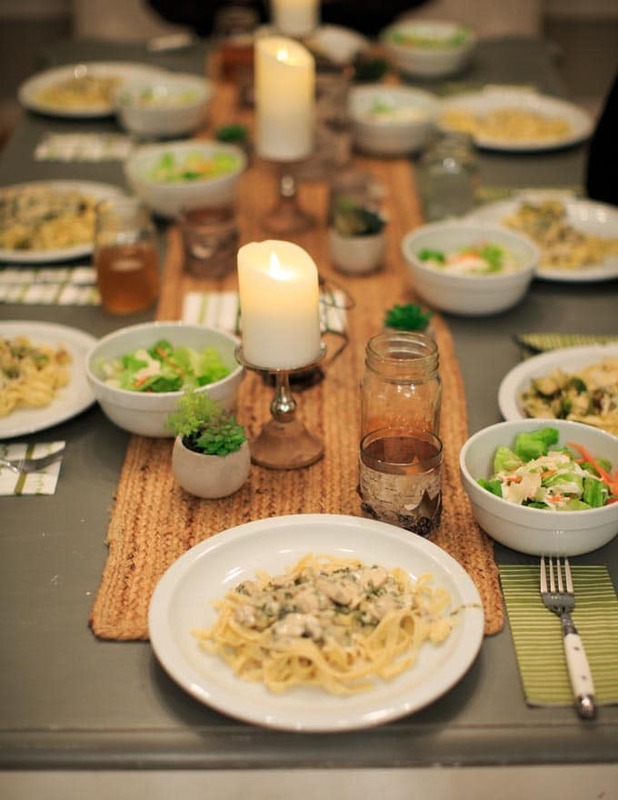 Host a dinner party and put your friends or family to work! 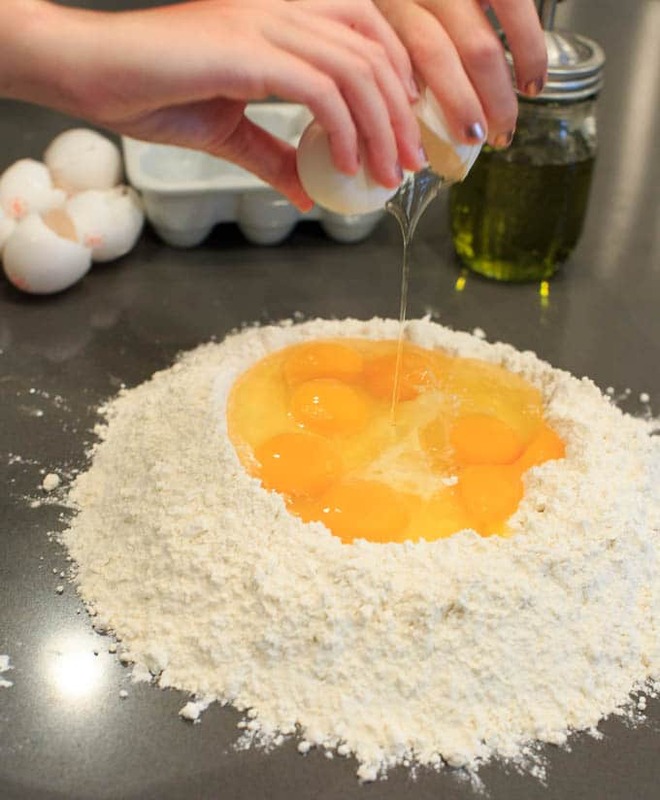 This post will help you make your own homemade pasta from scratch. 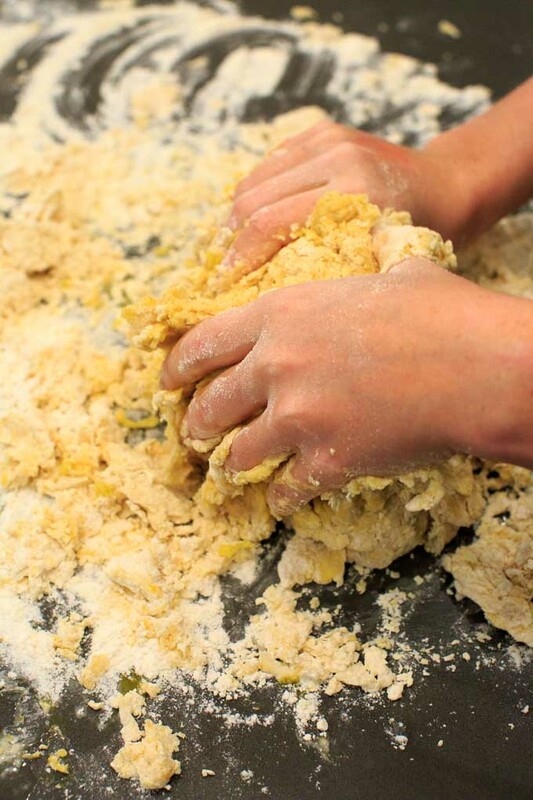 Have you ever made your own pasta? It’s not nearly as hard as you might think, as long as you have the right tools! EITHER a pasta roller machine or the attachment for a KitchenAid mixer. You can also roll the dough out and slice the noodles by hand without the equipment, but I don’t have pictures for that. The pasta making is the fun part, but you can also make your own homemade marinara sauce, alfredo sauce, salad and/or veggie sides. 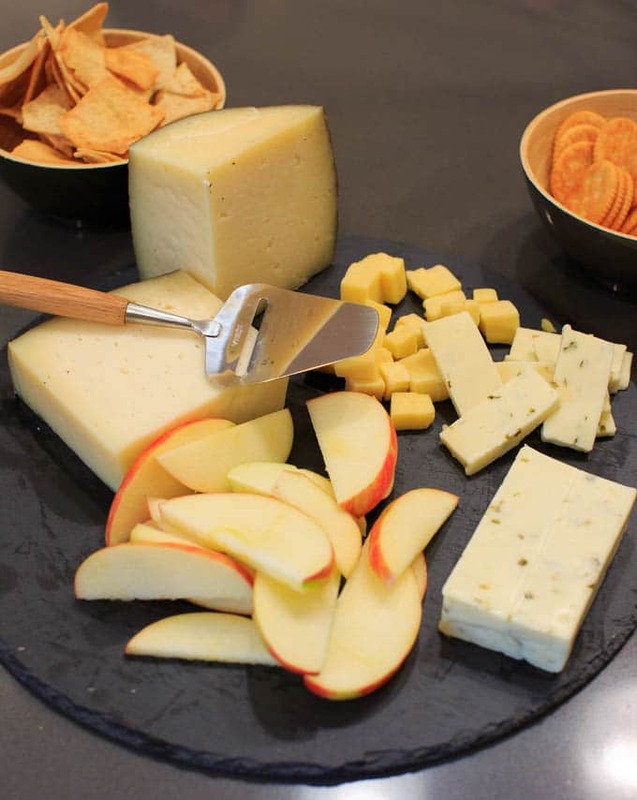 But first you might want to whip up a cheese plate. The work will make you hungry. Add 1/2 teaspoon each of salt and olive oil, then get to kneading. It will be a mess for a bit, but eventually it will be a smooth ball of dough. Separate into smaller balls (4 for a single batch). Now it’s time to use your machine or attachment! 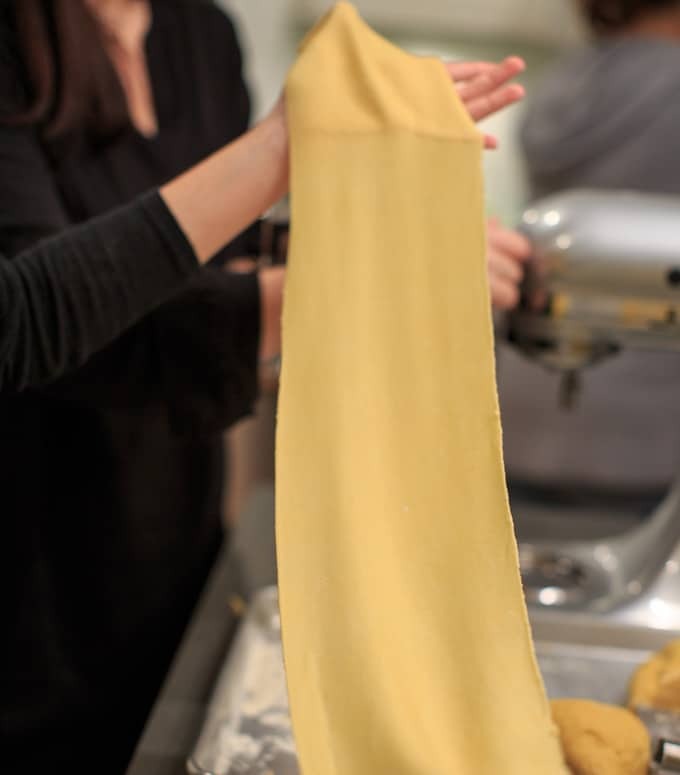 Flatten it out slightly with your hands and then run it through the pasta roller. Start at a higher number (thicker) and work your way down to a smaller number (thinner) to get the desired thickness. Usually I make them as thin as they can be without getting holes. On the topic of holes: it will probably happen the first couple times! Don’t fret. 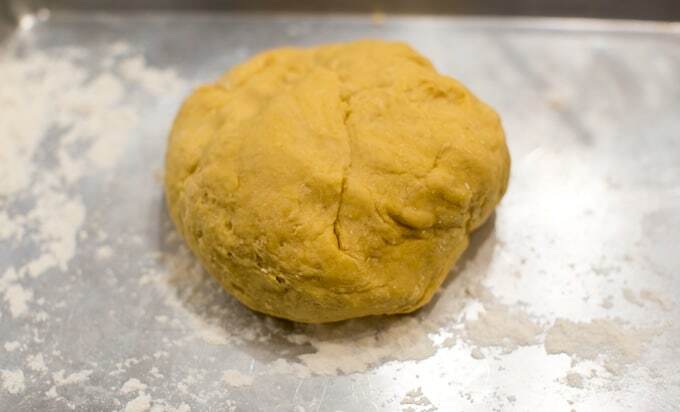 Just fold the dough back up and run it back through until you get it smooth. A stand-alone pasta machine usually has a hand crank. The KitchenAid attachment runs automatically which frees up a hand. Either way you’ll probably need a couple pairs of hands, especially if trying to snap a photo of your handiwork. 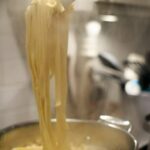 Using the cutter part of your pasta machine you’ll make your noodles! Separate carefully and place on dryer rack. Repeat until all dough is flattened and cut. 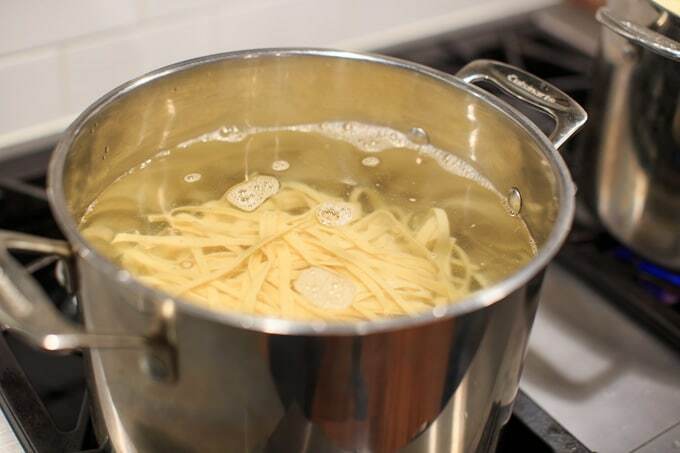 Boil a big pot of water and then add the pasta. If you doubled or tripled the recipe you’ll also want to do this in batches. In just a couple minutes your pasta will be done! You’ll know it’s cooked when it floats to the top of the water. 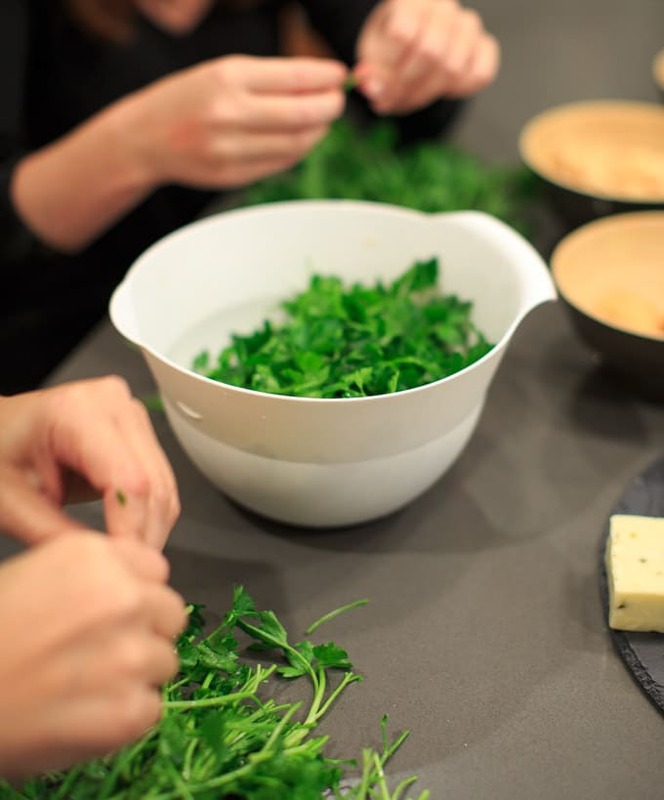 Maybe you also want to chop up some fresh parsley? 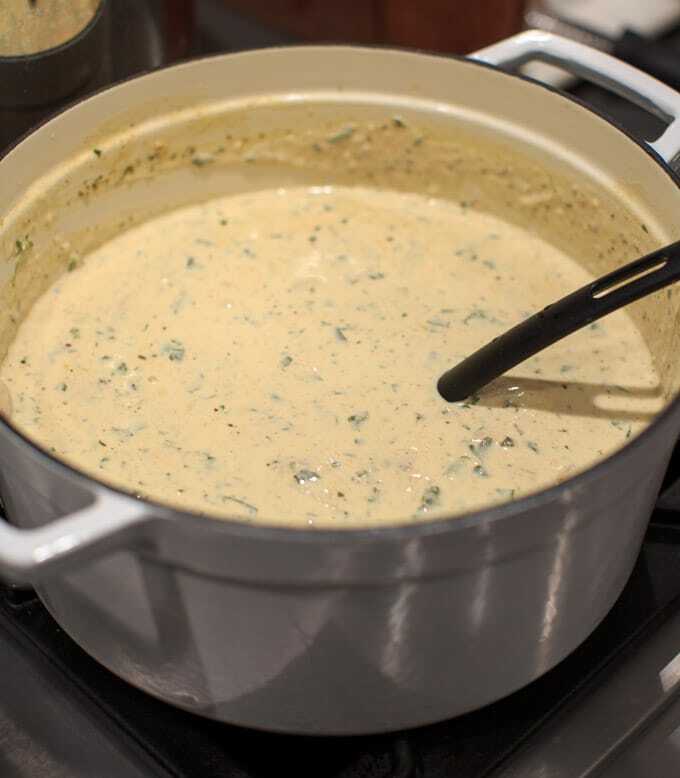 Or make your own alfredo or marinara sauce? On a clean surface, measure out flour and make a well in the center. 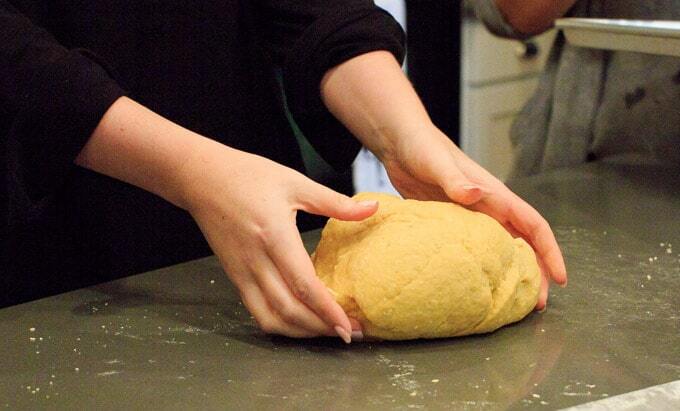 Knead by hand until smooth. Separate into 4 smaller balls. 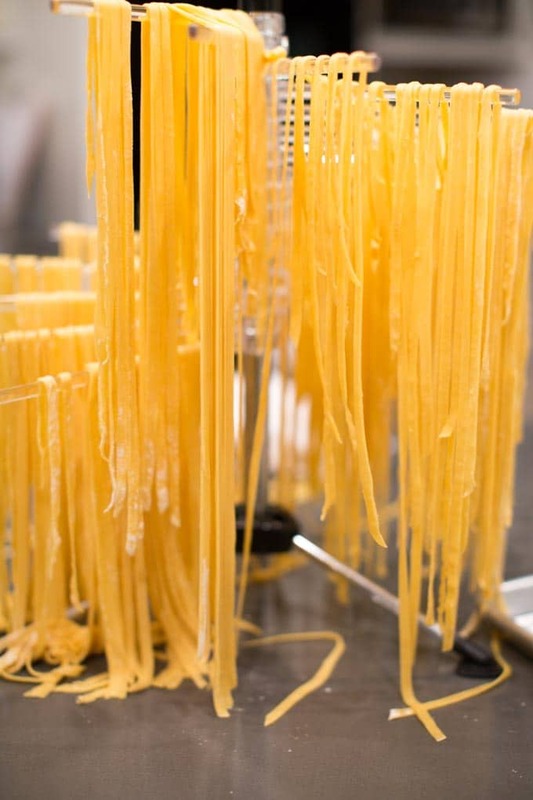 Using a pasta machine, flatten in stages working your way from higher numbers (thicker) to lower numbers (thinner) to as thin as desired. Will take several times through the machine to work your way down. Then use the pasta cutter part of the machine to make the noodles. Repeat steps with remaining dough. In a large pot, boil water over high heat. 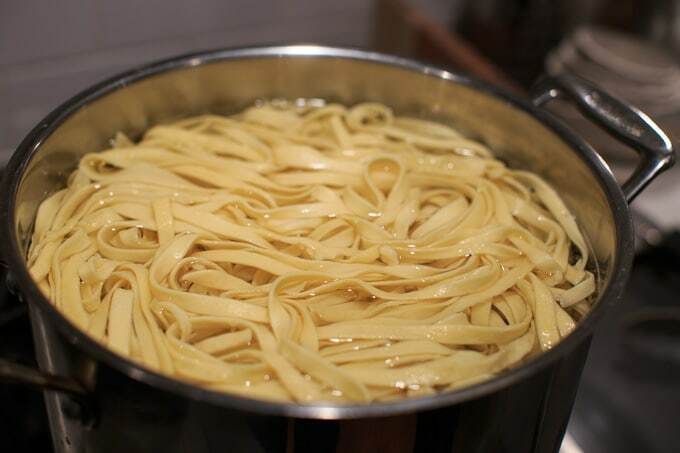 Once boiling, add pasta. 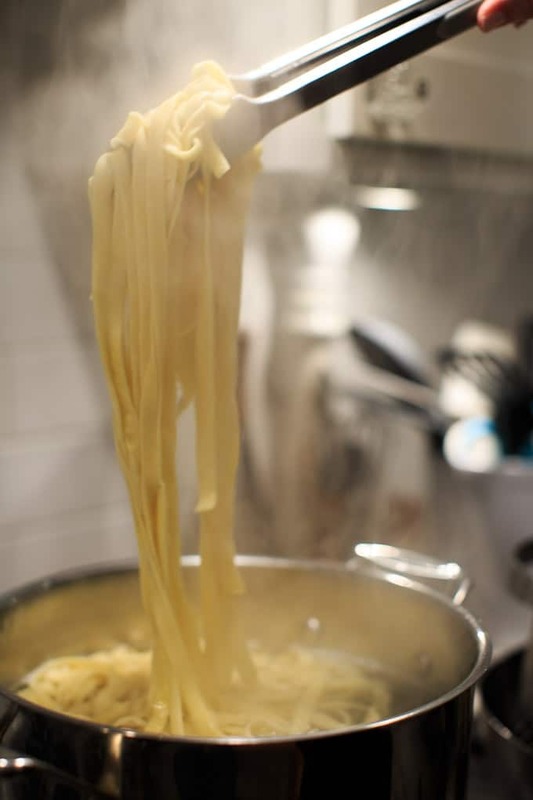 Once pasta is cooked (will only take a couple minutes) it will float to the top. Remove pasta from water. 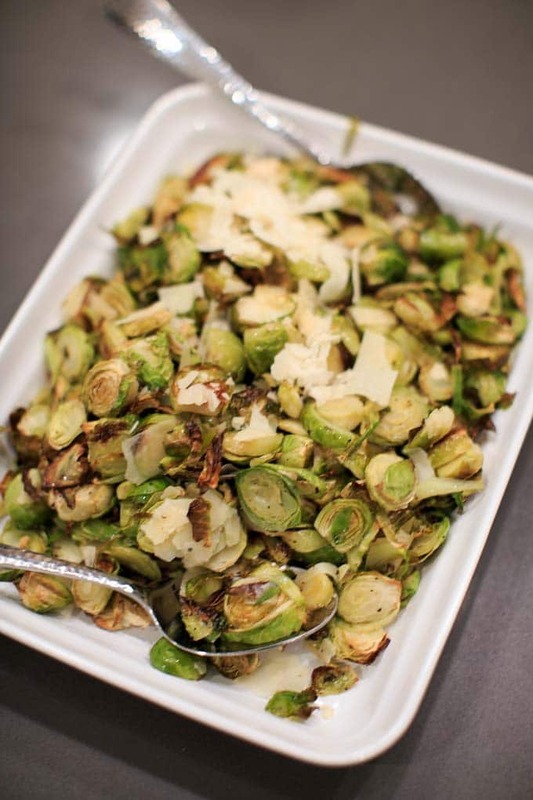 Serve with marinara or your desired sauces, salads and veggies! I absolutely love making pasta from scratch!!! I also love that you put your friends to work!! Hehe, I need to take more notes from you!! It’s a hands-on dinner party, so fun! I have never made my own pasta from scratch. I really need to try it and taste the difference. How fun! 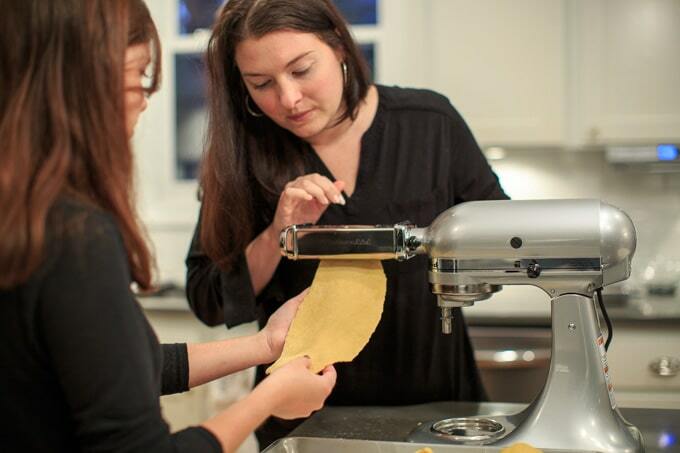 I love the idea of having people over to make pasta together. Great photos, too! I love making pasta at home. In fact for us it’s a kids project. They love it. Nothing like good homemade pasta..! You pictures are so amazing. Oh this is a great activity for kids to help with! Thanks Veena! 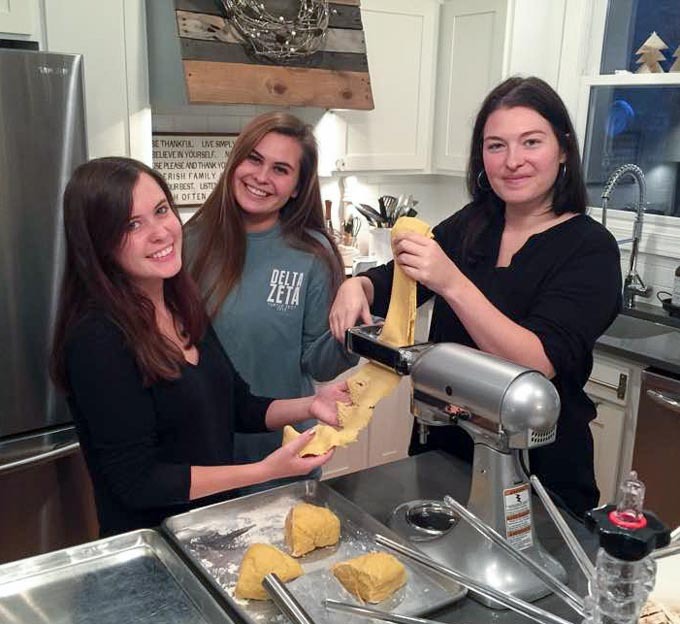 We’ve been making our own pasta for years!! It is simple and the taste is phenomenal. You did an nice job in your tutorial. After going through two large Kitchen Aid mixers in 12 years we did some research and bought an Ankarsrum mixer. I just bought the pasta maker attachments for it but haven’t used them yet. Your tutorial has given me the courage to do so. 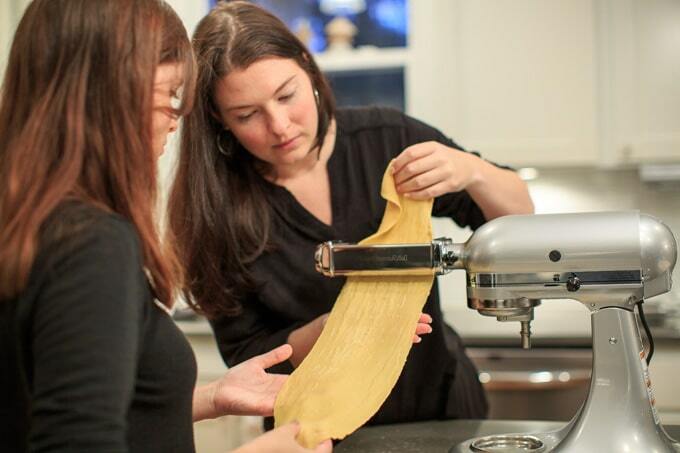 I have made pasta by hand in the past just not with a machine. I am having back surgery a week from Wednesday. I now have this on my to do list before it. It will be awhile before I will be able to after and you have definitely whetted my appetite for fresh pasta. 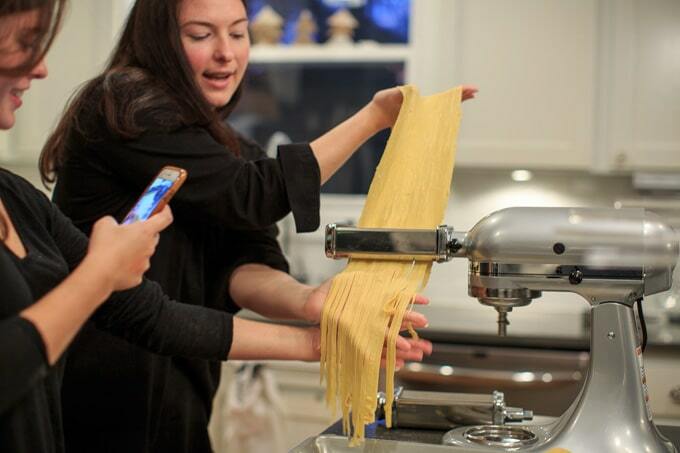 I make pasta all the time, but I’m usually alone – so no one to help me take pics! 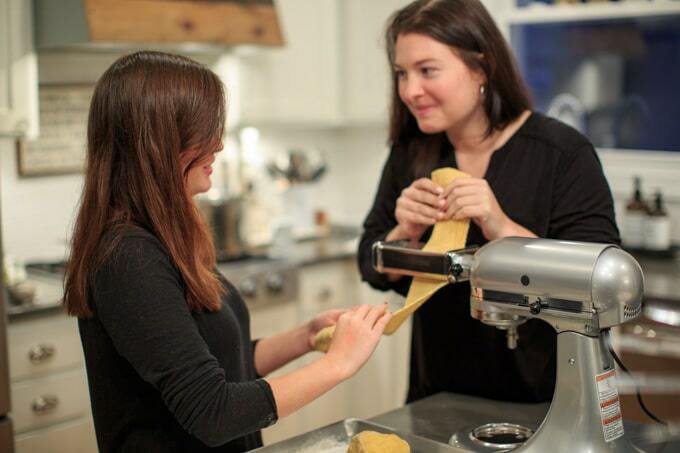 I love the idea of getting guests involved in their pasta making. Homemade food just tastes good! Thanks for the detailed recipe. We love pasta and this is something that I have never made from scratch but has been in my to do list for a long time. I am yet to buy the KA pasta attachment and now I know what I need for my birthday. 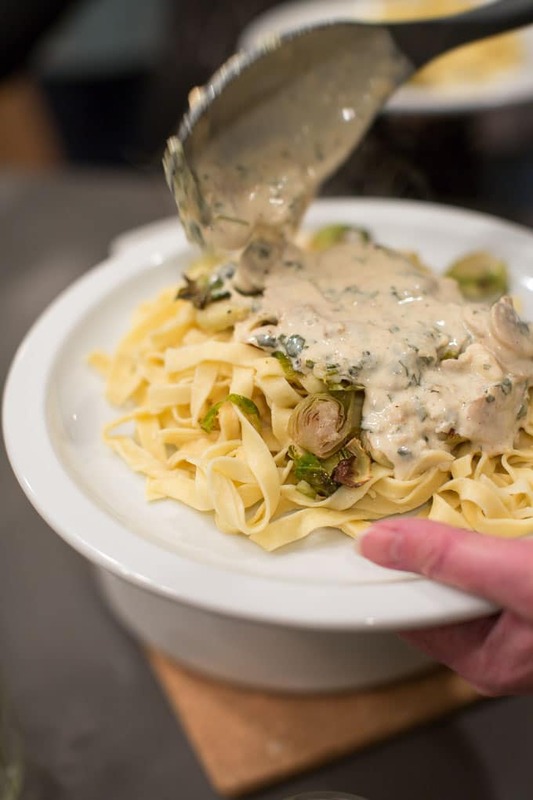 This makes me want to break out the pasta maker we have stashed away and give it another shot! I absolutely love that cheese spread and your table setting in the first photo – so elegant! I enjoyed reading this and seeing your photos, made me feel I was right there. Still getting over the “fear” of pasta. It’s getting better…and you helped. So glad to hear that Lindy! It’s a little intimidating the first time, but it’s so worth it!